Click here to view the printer-friendly “Controlling the Process” document. There are six key factors involved in the machining process. Each factor is a variable that can be altered by the user in order to produce the desired effect. Each is briefly explained below. Air pressure will directly affect the strength of the abrasive mixture and ultimately, the machine’s ability to cut into various materials. Simply, the higher the air pressure, the more agitated the powder mixture will become, producing a stronger stream. Likewise, the lower the air pressure, the gentler the final abrasive mixture. Essentially, how you want to use your Airbrasive® Micro Abrasive Blasting Unit will determine the amount of air pressure you will need to use. * Please note that for safety reasons the Airbrasive® Micro Abrasive Blasting Unit should never be pressurized beyond 120psi. The amount of powder that leaves the nozzle in one minute equals the powder flow rate. Therefore, the powder flow rate will be directly related to your chosen air pressure. 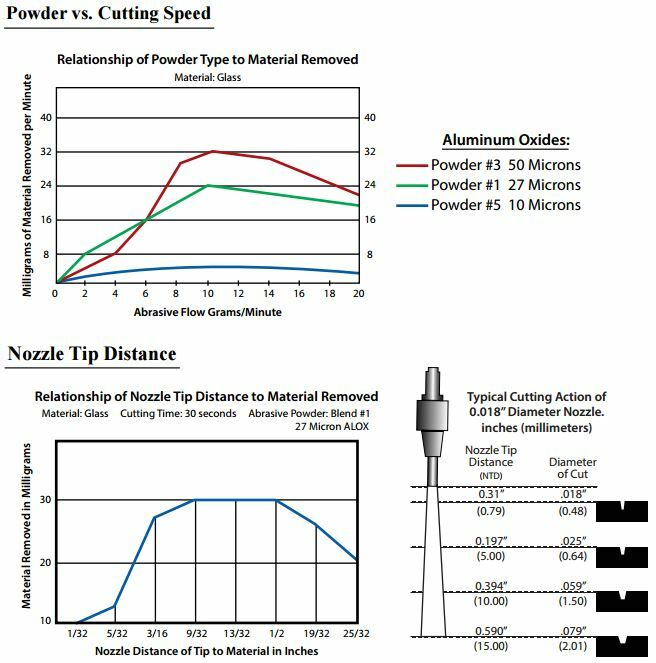 A higher powder flow rate will result in more precise cuts to your work surface. Nozzle orifices are shaped to be either round or rectangular. The nozzle widths vary in size from .005 inches up to .032. The size of the nozzle determines the area that will be impacted by the powder. The larger the nozzle, the greater the area. The shape of the nozzle is important for getting into unusually shaped spaces. A rectangular nozzle can lightly cover a large width or, when turned, heavily impact a narrow space. Perhaps the most important variable in the machining process is the type of powder you choose to work with. Airbrasive® Powders are blended from a variety of materials including aluminum oxide, glass beads, crushed glass, sodium bicarbonate and silicon carbide. We will recommend the best powder to suit your needs. Simply, the angle with which you approach your surface with your nozzle will play a great role in determining the speed and efficiency of your work. There are two options to choose from. You can either approach your material directly by holding your nozzle at an angle of 90, or you may approach your material at an angle by holding your nozzle at less than 90 and leaning to either the right or the left. By choosing the first option, shown in Figure 1 below, you will be operating under the Theory of Brittle Failure. 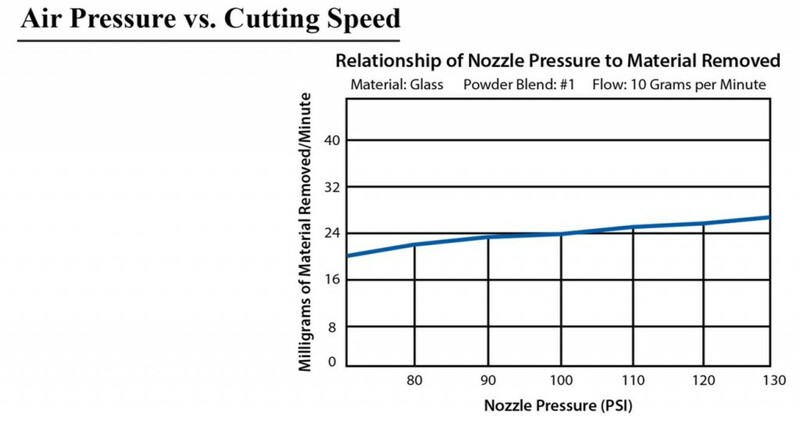 This theory describes that by holding your nozzle at 90, brittle failure? of your work surface will occur when the abrasive stream impacts it and literally blasts material out of way. 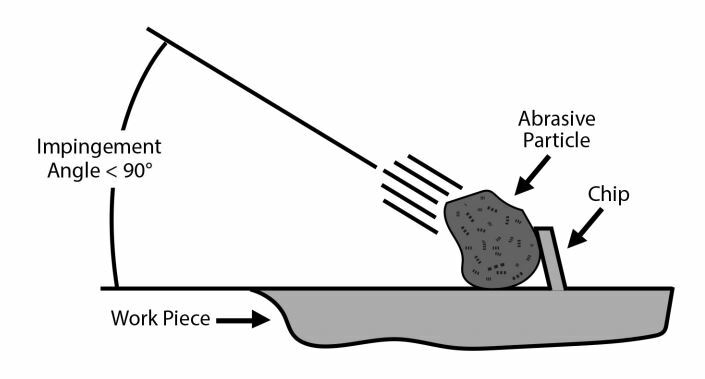 By choosing the second option, shown in Figure 2 below, you will be operating under the Theory of Ductile Failure. 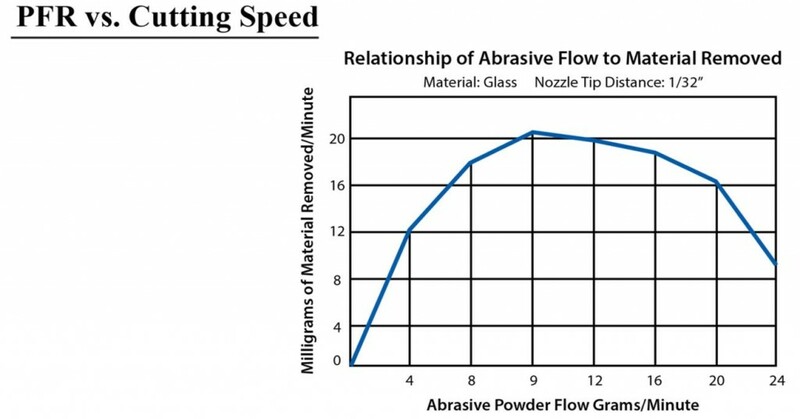 This theory describes that by holding your nozzle at an angle less than 90, ductile failure of your work surface will occur as the abrasive stream steadily chips away at the material. Tests have shown that maximum material removal for ductile materials occurs between a 15 and 45 degree angle of incidence. For a brittle material, maximum removal occurs at an angle of 90 degrees. The figures below represent the comparative material removal rates for both hard and soft substances that have either brittle or ductile properties.